This is mostly for ES-333 owners who may also have or have had a 335. I have a number of Gibson ES models, as well as ES clones in a variety of finishes. Lately I've been Jonesing for a natural ES-333 (I'm on a natural finish kick) even though I have the 335 body style (in natural) well covered with selections from a Gibson 335 figured, to other brands. My reasons??? I guess I really want a 335 WITH the back plate so I can more easily do some pup experimentation (removing the 490R/498T OEM pups for good) of which over the years I have accumulated a number of very cool pups, none with coil taps. I guess I "could" use my Midtown custom but it doesn't have the same semi vibe the 335 body does. The other thought I have is to use one of my 335's and install QD connectors and "ultimately" thin my 335's to a level more easily stored. Maybe I'm in the wrong place with a bunch of enablers hanging about so, for those 333 and 335 owners could you ultimately live with a 333 and forego a 335 altogether? I have a BB King and it has a control cover. I do not understand why ES-335's do not have them. Yes the one piece back looks nice, but it is not conducive pup and pot swap out. In addition to my Gibsons, I have a Cort Source BV, it is an Indonesian gear, very similar in shape to the 335 but with Bigsby and P90 type pickups. I changed the wiring because some problems with the old potentiometers, finally the luthier in charge told me, "I love the 335s but doing a maintenance is painful". I had a 335 and somehow could not bond with it, ergo sold it. and changed the knobs to reflectors. This 333 blows many 335s out of the water. 490 and 498 pickups are smooth and crisp enough and the output is perfect. And it has the natural finish. The former owner carried this guitar all over the world gigging here and there. Meanwhile we became good friends and when I tell him "lets jam some..."
he replies "but bring the 333 ! " I recently got one with burst buckers (my LEAST liked of Gibson pickups) once they do that the 335 sound becomes elusive. Many 333's have had the pups changed, I too like the 490 set, and gits that have had the pups diddled with are a no sale for me. That is nice. I got the same one in the same color. I've done a few things to mine like change the pickguard to black, put a red chicken head knob on the Varitone, and put a blank black truss rod cover on it. I really want to change everything out to chrome or nickel but don't feel like dropping that much cash for stuff that is not broke. Actually slightly different. Mine is a 2016 model, notice the difference in the headstock. Lucille headstock I believe yours is a 2015 model? Or earlier? 2009. My only complaint about the guitar is the gold hardware and the larger than life BB King on the headstock. Nowhere on this guitar, except the pots does it say Gibson on it. I like your headstock much better. I never noticed that your model didn't say Gibson on it, but now that you mention it, that is really strange that Gibson would do that. There may be others, but I can't even think of another Gibson that didn't have "Gibson" on the headstock. 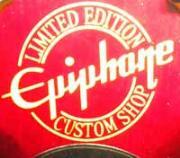 Heck, even some EPIs have "Gibson" on the headstock (truss rod cover, at least)! I think I was told there was one or two models in the past that did not have Gibson on the headstock. I thought it was a Trini Lopez ES-355 but I looked and they have it. I think the first Lucille's had Lucille and Gibson on the headstock, and then it went to just BB King and the Crown, then one year they made a run of colored ones named after jewels with BB King and the Crown on those (the diamond one was white, ruby was red ect. There were 6 colors in all) and now it is back to Lucille and Gibson on the HS. Wow $6999. Insane. I got mine for $2500. So did you buy one yet er whut?